Campus2Career’s comprehensive six-phase program described below allows our clients to discover and pursue a career path matching their skills, experience and interests. The phases are not linear and instead overlap with each other and depending on the scope of the career pursuit, many of the phases may be revisited throughout the program. The overall time period of the program depends upon a number of factors, unique to each client, but we will be with you the entire way. In addition, there is off-site “homework” and regular communication. Much of the work can be done from any location, leveraging today’s technology. This is a complimentary meeting among our principals, the client and his/her sponsors (generally parents) to discuss the program expectations and desired outcomes. We believe firmly that there must be good chemistry between the senior partner and client for the program to be successful. An expected timeline will be established to guide client progress throughout the C2C program. A thorough assessment of our client’s strengths, needs, preferences, motivators and values is conducted to help form a foundation in identifying his/her goals and how to achieve them. The best method for accomplishing this is to use a series of assessment instruments that are interpreted by our expert in this field. This phase is an essential part of the job search when career goals and direction are uncertain. The results of the evaluations are then discussed with the client and sponsors. Afterwards, a personalized career exploration strategy with clear qualitative and quantitative expectations is formulated that focuses on critical concepts like networking and identifying companies of interest. Based on the information gathered during the Personal Assessments Phase (Phase I), and through discussions with the individual, we will have a good sense of the type of work that is preferred and consistent with the client’s skill set. At this point, we target specific organizations and conduct extensive market and industry research. We identify key personnel, important business issues facing the target industry and organizations, and the optimal strategy to land interviews. In essence, a road map is created. In an ongoing professional skills development process, we work with the client to develop competencies in resume writing, presentation skills, references, email etiquette, and marketing/business letter writing. This is particularly recommended for those who have never conducted a serious job search. It’s critical for our client to have strong, confident interviewing and communication skills so he/she is able to maximize the impact made on others. Learning how to interview and answer tough questions will help build self-confidence and demonstrate purposefulness when interacting with professionals in unfamiliar settings. The better our clients understand and are comfortable interviewing, the better the results. We will conduct a mock telephone and an in-person interview and videotape the results to provide complete performance feedback. Talking to personal and business contacts is the most effective method of conducting a job search. Our training enables our client to identify prospective jobs from many sources. We teach the concepts of choosing key personal contacts and locating the “hidden” jobs that account for the placement of over half the job opportunities. In addition, informational interviews with key industry contacts will help the client better understand the nature of their desired career path and the career possibilities within their chosen career. C2C’s Board of Advisors plays an integral part of this process as the members have extensive experience in a variety of industries. When a desired job offer is extended, it is time to negotiate. The goal of negotiating is to come to an agreement about the complete job package. We work with our client to develop a negotiating strategy that includes everything from compensation to job responsibilities. Once a starting date has been agreed with the new employer, we discuss the most effective “onboarding” strategy with the client. It’s vital that our clients get off to a strong start; we will help them navigate the uncertain waters often found in the early days on a new job. For some career consultants this key element is almost cursory involving a pep talk, some platitudes and a handshake. 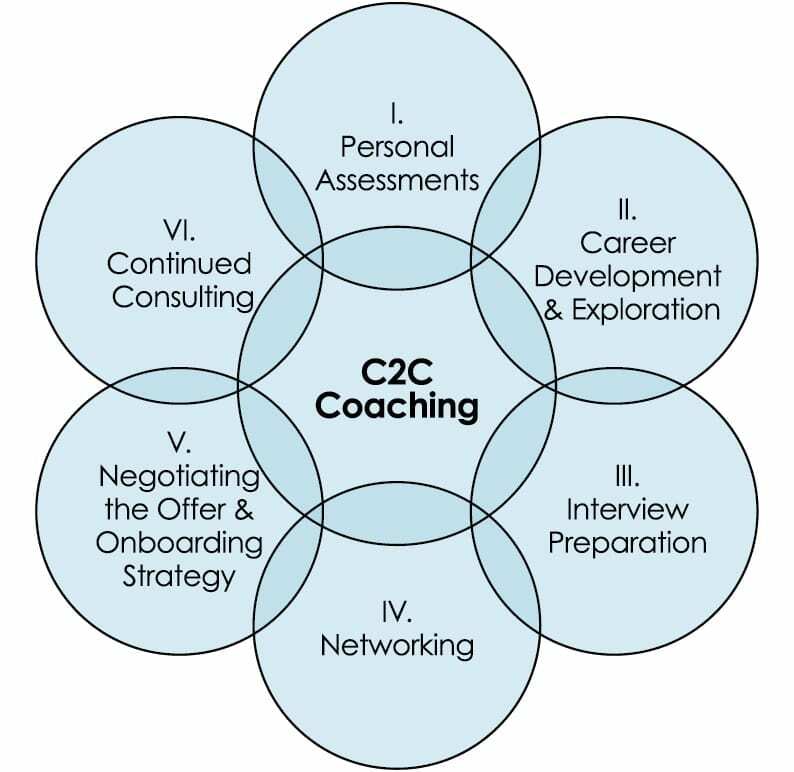 For C2C, this phase involves a detailed evaluation of your assessments as it relates to the position/role and the organizational culture to ensure that issues of style and experience, communications skill and appropriate business behavior will mesh effectively with your new employer. The first 90 days is a pivotal time to build relationship, address early expectations with your manager, to learn more about the “current situation” and how that will affect the position you accepted and much more. At C2C, we take a holistic look at successful transitions and how to ensure early success in any new role. And after that, we remain available for further discussions as you settle into your new job.